In writing Chigger Foot Boys, author Patricia Cumper wanted to pay tribute to the African and Caribbean soldiers who lost their lives in the First World War. Her play observes the conflict through the eyes of five ordinary people, who meet at a rum bar in Kingston, Jamaica. The Chigger Foot boy here is Mortie, a poor country boy in Kingston who overhears the gossip about a war in Europe from others stranded in the bar during a storm. Cumper’s narrative slides through time and space to reveal the fates of each character, but her trump card is the language. The poetry of colloquialism and rhythm of dialect combine to establish a evocative sense of place and time. This is coupled with a sure-footed directorial style from Irinia Brown, who heightens the dramatic content with percussion and a simple design by Louis Price, which provides a constant reminder of colonial influence. The warmth of the writing is enhanced by some touching performances, notably from Ike Bennett, who makes his professional debut here. Bennett underscores Mortie with gentle self-confidence, providing a more than adequate match for Stanley J Browne’s petulant career soldier. 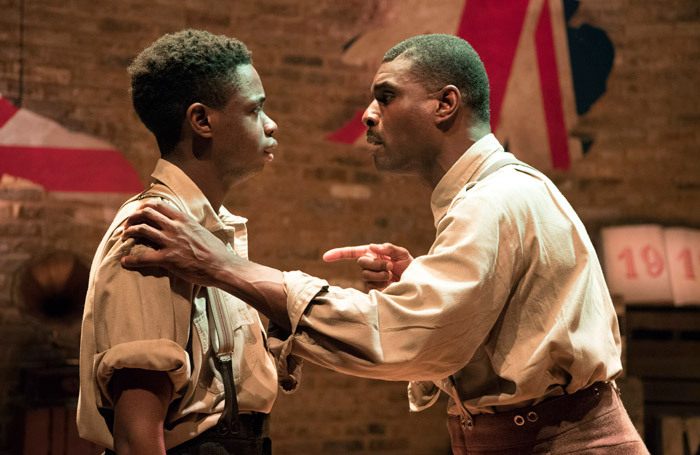 Yet despite demonstrably masculine themes, Crumper’s play is grounded by Suzette Llewellyn’s Medora, the bar owner who observes the devastation of this white man’s war and sides with emerging activist Marcus Garvey. Ultimately Cumper’s play touches on similar territory to several new works commissioned to commemorate the centenary of the First World War. The themes of futility and loss are strikingly familiar but the perspective is wholly enlightening.